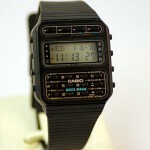 Rewind to 1983 and you could have purchased this gem in your local department store. The marvelous CD-40, a 24-button multi-function watch, the first of its kind. What does it do…calculator? Check. Alarm? Yep. Stopwatch. Hourly chime. 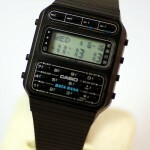 And Casio’s Data Bank feature. Think of it as a note pad on your wrist. Not so high tech today, but this watch is almost thirty years old! 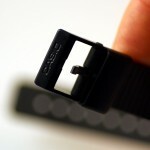 Plastic case, genuine signed resin strap. Works perfectly. $169 USD plus shipping. Payment accepted via Google Checkout or credit card. In person pickup available if you’re near Atlanta. Contact us for more information. 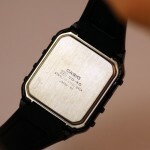 This entry was posted in For Sale, Nerd Watch by pocketcalculatorshow. Bookmark the permalink. I am interested. What is the condition of the watch? Is it original or reproduction? I have one i don’t now who much cust? I want to buy this watch. Please tell how should I buy this watch? I am interested in this watch. Is it still available?